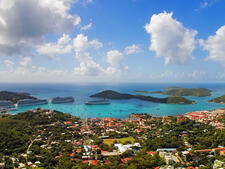 Virgin Gorda ranks as a popular cruise destination because of its white sands and clear, turquoise seas. Plus, the island is undeveloped enough to still feel like a private, exclusive place. One of the most popular and fascinating natural attractions in the Caribbean is also located here -- a beach strewn with giant boulders known as The Baths. Brought to the ocean's edge by volcanic activity, the boulders form caves, grottoes and tidal pools, well worth exploring. Christopher Columbus spotted the island in 1493, on his second trip to the New World, and gave Virgin Gorda its name. Looking at the island's mountain ridge -- and no doubt tired of being at sea with a bunch of sailors -- he thought what is now called Gorda Peak looked liked the belly of a reclining chubby woman. 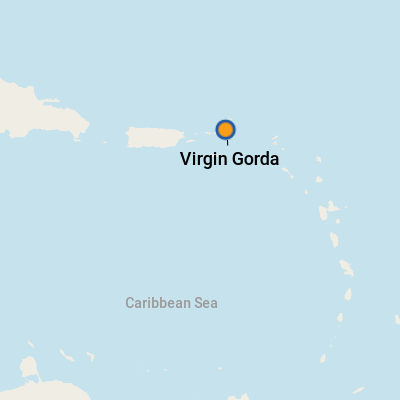 Hence, he called it Virgin Gorda, or "fat virgin" in Spanish. A no man's land for a time, Virgin Gorda and other British Virgin Islands were used by pirates as a base for raids on Spanish galleons (large sailing ships). Capt. William Kidd was among the more notorious. The British established a sugar trade on the island in the 1700's, but that ended when Britain abolished slavery in 1838. A copper mine was opened around the same time and operated for about 24 years before it was abandoned. The ruins are now part of a national park. Fishing and farming were the way of life for a century. Then Laurance Rockefeller, the New York financier and conservationist, came in the 1960's and opened an exclusive eco-resort called Little Dix Bay. 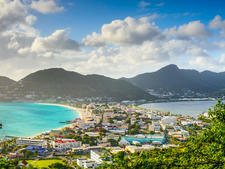 By the 1970's, Virgin Gorda was "discovered" as a tourist destination, and tourism remains the mainstay of the economy. Only 12 miles from Tortola, the 8.5-square-mile island, with a population of 3,500, remains remarkably quiet. Most visitors hang out at swanky private resorts or arrive by private yacht to enjoy some of the best powder sand beaches in the Caribbean. Given the rather small geographical scope of the island and the large number of taxis available, it's a pretty easy place to explore on your own. Visitors typically are drawn to two main areas of interest -- attractions near Spanish Town at the south end of the island and North Sound at the other extreme. Offshore, popular attractions include The Dogs, the marine area protected by the BVI National Parks Trust and considered to be one of the best snorkeling and diving sites in the Caribbean -- the waters are teeming with marine life and colorful coral formations. If you are anchored off Spanish Town, you will be tendering into the Virgin Gorda Yacht Harbour, which is home to plenty of shops and restaurants. It might look like a tourist complex, but it's actually the island's main commercial center. If you are in the North Sound (a favorite place for small cruise ships to anchor), you may tender to the main dock at the Bitter End Yacht Club, a full-service resort. 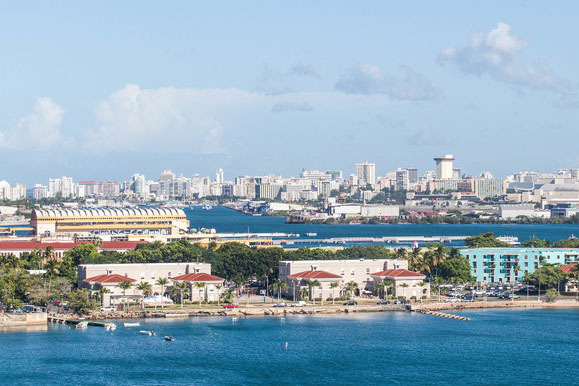 In Spanish Town, you walk off the tender about 250 feet from an open-air shopping complex with a number of resort-wear and gift shops, restaurants, a dive shop, bank, bakery and laundromat. Buck's Food Market, a full-service grocery store, is across the parking lot. If you linger at the pier, you'll find yourself among palm trees and sailboats. In North Sound, you tender to Bitter End Yacht Club, a resort complex overlooking the blue sea. The resort features gift and souvenir shops, restaurants and water sports offerings, including a sailing school (open to guests and visitors). If you decide to explore on foot, you'll often have to walk in the street. There aren't many sidewalks. Note: There is no public transportation. By Taxi: Open-air jitneys or vans are the typical modes of visitor transport. With taxi fares, the more passengers aboard, the better the per-person rate, so it pays to round up a group and share a ride. The 10-minute ride to The Baths from the Yacht Harbour costs about $4 per person for four people. A 90-minute island tour is about $15 per person, for a minimum of three passengers. The fare to the Bitter End or Gorda Peak is about $17 to $20 per person. Be aware that the road system in Virgin Gorda is incomplete, which means you need to take a ferry to some spots. (For example, to get to the Bitter End from the Yacht Harbour, you take a taxi to Gun Creek and then the ferry to your destination.) If you are doing a multi-hour tour, make sure the taxi has air-conditioning -- not all do. By Rental Car: You'll encounter some very steep roads especially if you head up to Gorda Peak, so a 4x4 vehicle is recommended, with rates around $60 per day. Driving is on the left. Several companies will pick you up at the dock if you make reservations: Try Andy's Jeep Rental (284-495-5252), Speedy's Car Rental (284-495-5240) or Mahogany Rentals (284-495-5469). By Ferry: The Bitter End Yacht Club ferry (284-494-2746) runs between Gun Creek and the yacht club hourly on the half hour, free of charge, and takes less than 30 minutes. The North Sound Express (284-495-2138) runs between Spanish Town and the Bitter End Yacht Club, a trip that takes about 90 minutes, and reservations are required; there is a fee to ride, with reduced fares for kids and infants. The currency is the U.S. Dollar. ATM's are commonplace, and there's even a FirstCaribbean International Bank branch in the Yacht Harbour complex. English is the official language in this island, though Caribbean patois is common. Grilled Caribbean lobster, conch, goat or chicken curry and other regional specialties appear on restaurant menus along with more standard international fare. For a local snack, try patties, which are baked meat pies filled with ground beef, saltfish, tuna or chicken. The national drink is the "Painkiller," made of rum, pineapple juice, orange juice and coconut milk.